The A14 provides a vital road transport corridor between the West Midlands and East Anglia, and is of local, regional, national and international significance. The section of the route between Huntingdon and Cambridge carries a high level of commuter as well as long-distance traffic and provides a strategic link between the A1 and the M11 motorway. The A14 carries around 85,000 vehicles per day; 26% of this is HGV traffic (against the national average of 10%). It is frequently congested and traffic is often disrupted by breakdowns, accidents and roadworks. A new 12.5 mile bypass will provide a two lane dual carriageway between Ellington and the A1 at Brampton and a three lane dual carriageway between Brampton and Swavesey. This will remove a large proportion of traffic from the existing A14 between Huntingdon and Swavesey, as well as Brampton Hut and Spittals interchange. The new bypass will include a 750m viaduct across the river Great Ouse and East Coast main line. It will include junctions with the A1 at Brampton and with the A1198 at Godmanchester. We’re widening the A1 from a 2 lane dual carriageway to a three lane dual carriageway, between Brampton and Alconbury (approximately three and a half miles). Between Brampton and Brampton Hut we will construct a new road to the west of the existing A1. The existing A1 road here will become part of the new A14 Huntingdon Southern Bypass. We’re widening the existing A14 over approximately five and a half miles to provide three lanes in each direction between Swavesey and Bar Hill, and four lanes in each direction between Bar Hill and Girton. We’re also widening one and a half miles of the Cambridge Northern Bypass between Histon and Milton. We’re improving existing junctions at Swavesey, Bar Hill and Girton to make sure they are compatible with proposed developments such as Northstowe. We’re also improving connections for cyclists, horseriders and pedestrians. We’ll remove the A14 rail viaduct over the East Coast main line and Brampton Road in Huntingdon. 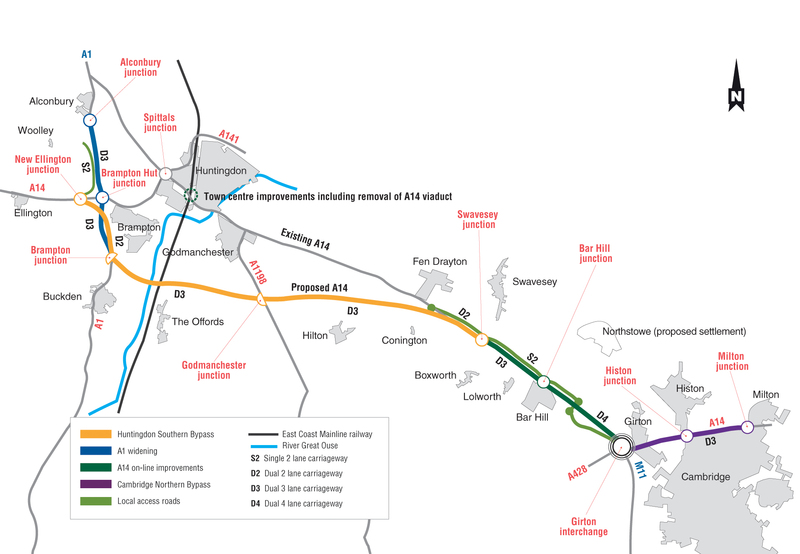 A through route will be maintained through Huntingdon, making use of the Brampton Road bridge to cross the railway line and constructing a new link road from Brampton Road to connect with the A14 to the west. Once work is complete the existing A14 will be ‘de-trunked’ between Huntingdon and Swavesey and between Alconbury and Spittals interchange. This means that responsibility for the road will pass to the local authority. Read more about our work in Huntingdon. We’re constructing a new dual carriageway, approximately five miles in length, between Fen Drayton and Swavesey and a single carriageway between Swavesey and Girton. This will provide a route for local traffic between Cambridge and Huntingdon, as well as access to properties and businesses along the corridor.